Many health issues in Rocinha can spread to affect global health due to the prevalence of infectious diseases in the favela that can spread very easily to other places due to the large migration rates of residents in favelas. In Rocinha, the living conditions may not be ideal, but they are perfect for the transmission of many diseases. There are also only two health clinics in Rocinha, one of which is a local church, and the other was just establish in 2009. This is definitely not enough to treat all of the sick people in Rio's largest slum. Poor ventilation, overcrowded housing, and narrow streets enhance the transmission of tuberculosis, which is causes when the Koch's bacillus is spread through the air when an individual coughs or sneezes. In Brazil, tuberculosis is the fourth leading cause of death, and the number one cause of death for people with HIV/AIDS. However, whereas the rate of tuberculosis in Brazil is 37.5 cases per 100,000 people, the rate in Rocinha is much higher: 380 per 100,000 people. This is the highest rate of tuberculosis of any community in the world. Efforts to slow the disease are working though, through a Directly Observed Treatment (DOT) system, people are encouraged to finish their treatment, reducing the risk of it spreading and becoming resistant to drugs, both side effects of when a person abandons treatment. The cure rate of tuberculosis has gone up from 68 percent to 84 percent, a definite improvement. Another disease in Rio's favelas is leprosy. After India, Brazil has the highest rate of leprosy, with 50,000 new cases a year. Many favela residents don't know much about leprosy or how its transmitted. The bacteria that causes leprosy is similar to Koch's bacillus, but it isn't very contagious; 90 to 95 percent of people are naturally immune to it. However, since favelas including Rocinha are densely populated and have other sanitation issues, Leprosy is still prevalent, though it doesn't get as much attention as TB or HIV. Leprosy patients lose feeling in their limbs, which can lead to cuts getting infected. Dengue fever is another disease common in Brazil, especially in favelas. Unlike leprosy and tuberculosis, dengue is a viral disease spread by mosquitoes. Rocinha is the perfect place for mosquito proliferation because of its poor sanitation which includes a sewage channel running through the neighborhood and very few houses with running water. 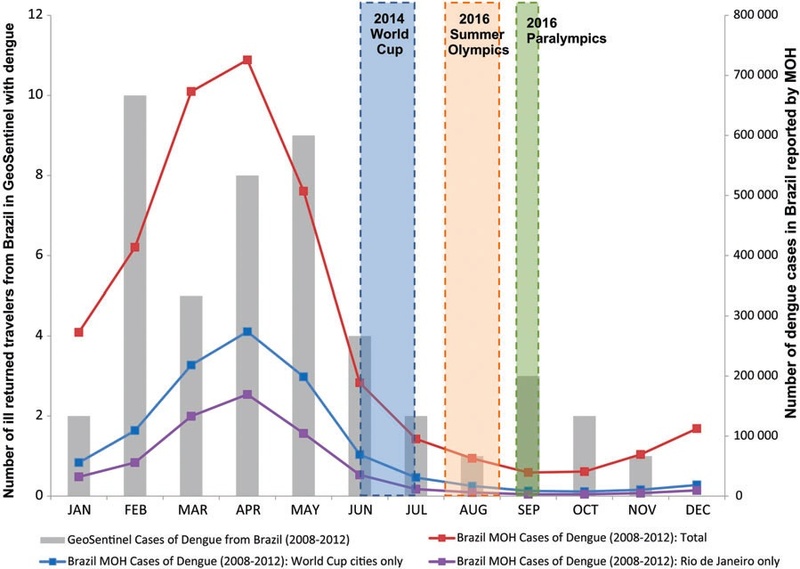 Dengue epidemics have popped up in recent years in Rio including in 2002 and in 2008. About fifty percent of dengue fever cases happen in Brazil and seventy percent of Brazil's cases happen in Rio. The symptoms of dengue include a fever, nausea, bleeding, and a skin rash, and worsen each time a victim gets it. This graph shows the cases of dengue fever per month in Brazil. It makes sense that the rate of dengue rises from November to April and then falls because Brazil's rainy season is from November to April, and dengue fever usually proliferates in wet climates.